If you’ve been following the Kentucky Amish SMV case, you know that some people still do. Jacob Gingerich of Graves County, Kentucky recently wrote 138 letters to KY legislators explaining the Swartzentruber Amish position on the safety triangle. Thanks in part to Gingerich’s efforts, a compromise bill acceptable to his people has quickly passed the KY Senate and is now moving through the House with momentum. I’m having trouble remembering the last time I wrote a letter. I don’t think Christmas cards or postcards count. Five minutes staring at the screen here and I’m still drawing a blank. Probably to Amish friends a few years ago. It makes sense that Amish would send and receive more letters than we do. On the other hand not all Amish are letter-writers. Just going by the handwriting of some Amish people–like with us English, more often men (Amish women tend to have finer, often impeccable penmanship)–not everyone’s comfortable penning daily missives (though I’m hardly one to talk, I had doctor’s handwriting in grade school and surgeon general’s handwriting today). Still, letter-writing is strongly rooted in Amish culture as a whole, as we see in things like the circle letter tradition and even in the rare bit of political activism. Is there any chance of letter-writing reviving in “English America”? We do see certain cultural elements come full-circle and return to some role in mass society. Often they are aspects of fashion, like bell-bottoms or muscle-car styling. Less so with technology, unless it’s a limited connoisseur market (say the minority of music aficionados who listen to vinyl records or English hobby farmers using horse-drawn equipment to reconnect with the land). Technology is more about what makes sense and gets things done effectively rather than being fundamentally about aesthetic appeal. Which is why it’s harder for old technologies to have big comebacks. Letters are really just a technology–one that’s been superseded by a wide range of instantaneous messaging that just gets the job done a lot more efficiently. That said there are intangible aspects to letter-writing that make it about more than just getting info from point A to point B. The act–the taking the time to write a letter–sends a message in and of itself. Perhaps that’s why the 138 Kentucky legislators were moved in the Amish direction. All I know is that when I do receive the occasional hand-penned letter, I never hit “delete”. Maybe there are enough letter-writing enthusiasts out there to form a nucleus for a future revival. Perhaps people, craving simpler ways of being, will consciously return to writing letters en masse. Or maybe letter-writing will turn trendy, becoming for some a “retro” leisure-time activity indicating status and a wealth of time. But ultimately letter-writing is the harder, more time-consuming choice. As a society we’re more and more allergic to that kind of option, so I am skeptical. What do you think? Do you ever put pen to paper anymore? 73 responses to Does anyone still write letters? I still write too keep track of family in Ohio and Florida. Mostly by hand but my wife found a portable typewriter at a yard sale that they gave to me for Christmas. My sister makes fun of me because I have to get on the internet to get the ribbon to use my tupewriter. She has a point but on a little diffrent note (no pun intended) we homeschool our boys, my wife was told that in some districts they are not even teaching penmenship/cursive. (I dont know how true this is or where but I have heard the same from her sister) Sad state of affairs, kids cant read and now they cant write. It’s true that in many states, cursive is not being taught in public schools. New Mexico is one of them. It is very strange to see the handwriting of a person in his/her 20s and realize that it is all block letters. Many private schools are still teaching it, especially Christian schools. I think I am too far gone, to go back to letter writing. I sometimes in a romantic nostalgic daydream resolve to start writing letters and surprise my friends and family, but then I go back to Skyping at Starbucks on wi-fi and my laptop. I really wish someday I could go back, as I think letter writing is a lost art. One of the things I love about letter writing is it takes more thought to write something down. If I am going to put it down on pen and ink I will do so with a little more care. Which brings me to my point. Letters are like historical time machines. When I was a boy, I used to subscribe to the magazine Civil War times and they would from time to time publish letters from that time period. And when I read letters from Billy Yank or Jonny Reb to their families, such heart-felt words, I could not only empathise with them, but also get an idea of what life was like, better than from ‘secondary sources’. Maybe some people would argue that with the Amish time stands still. I disagree. Amish society is dynamic and interacts with the world around them. Just at a different rhythm. A chronicle of Amish letters through time (as long as they are not too personal) would be an interesting historical study. To see how Amish life has changed. writing at least one letter a month(instead of email) to do my part to help out. My one letter a month will have a minuscule effect on post office income, but if every adult in the US would do the same, just think how much more income per month the USPO would have. I think letter writing is alive and well in Amish communities. Amish storekeepers I knew whose death I learned about in The Budget and I received a long letter back from the person’s sister. the sheet of paper, so he cut off the paper half-way down. At the same time, one of my non-Amish friends received a letter from an Amish friend. The letter only took up 2/3 of the page, and that writer had also cut off the paper where the letter ended. My friend and I compared letters and remarked that even in letter-writing, these Amish friends are thrifty! In the early 1980’s I bought a set of buggy harness from an Amish harness maker in the New Wilmington, PA Old Order Amish community. Shortly after I received it I wrote a letter to Roman, the harness maker, asking a few questions. He flipped my letter over and wrote the reply on the reverse side. I thought that was very interesting, but since I had asked specific questions I assumed that he did it so I could look back at my questions and match up to his answers. However, soon after I wrote to him again and when he replied he again used the reverse side of the letter. We continued to correspond for a number of years, though I can’t say that he ever wrote to me first, he did faithfully reply every time that wrote to him. In every instance he wrote on the reverse side of my letter. That is not only thrifty, but actually pretty darn logical as it is easy to flip the letter back over and read the original letter if there is something you don’t understand in the response. Did any letter you ever wrote to an Amish person come back to you with their response on the reverse? I still write letters especially to those who aren’t high tech, like elderly relatives that refuse the modern devices, but especially when I want to convey something from my heart. I also send real cards with additional notes and surprises inside. I love beautiful stationary and I’m sure those receiveing it, love it as well, as people just don’t take the time now days. I beleive that taking the time really conveys your hearts feeling and is right up there with a made from scratch meal or hand made item. The time and effort and care you put into something shows your deep love. I also like to do this as I know it makes people’s day! I LIKE NICE STATIONARY TOO, BUT I WENT TO HALLMARK AND EVERYWHERE ELSE AND I WAS UNABLE TO FIND ANY. I still write and i am not old.i do not have a computer at home,but must go to a library.i do not get a lot of letters written back to me…so the other communication is telephone.i wonder what happened to the old phones that hung on a wall or even the tin can with the wire is better then most of these cellphones and copmputers. I still write letters. I think it is become a lost art. I enjoy writting it saves my hands. I wrote alot when my husband was overseas, as did he, I loved to see his written words. I have a few friends that don’t use computers at all. And I enjoy seeing there letters in the mail. Wish I had more friends that liked to write. I still letter write but it’s mostly to sponsored children, some in Uganda, Israel, Florida and India. I wish more letters were written instead of typed through email. It is a dying art. In school, it is true that children are not talk cursive. What a shame. I meant children are not taught to write cursive. Sorry. I hand-wrote two letters yesterday (one 8-page and one 6)and will write another long one today, but I must admit that is unusual for me! All three letters were to parents and parents-in-law who do not do email. But my reason for writing went beyond that fact. I wanted them to be able to hold my letters in their hands and read and re-read them. 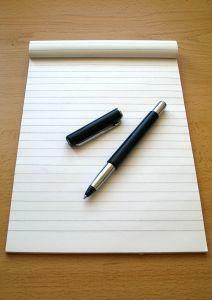 There is something warm and intimate about handwriting that conveys a bit of the writer’s love and personality. I also wrote a letter last week to a sister-in-law who does not email but texts instead. I typed hers on the computer and included a spreadsheet which would not have translated well onto a little phone screen, and it was information that needed to be very clear. Again, it was something I wanted her to be able to hold in her hands, read and re-read. One of my resolutions this year has been to be more intentional in my relationships with friends and family, and that includes writing letters or notes and mailing them. It has turned into most days just sending an encouraging e-mail or posting a greeting on their facebook page, but I am now reminded that I need to be sending those hand-written letters, too. Letters are a joy to receive in the mail! Christine W. and I are in the same boat. I still write letters to a few friends who do not use computers for whatever reason. Sometimes I send paper cards or letters because I like to decorate the paper with my extensive collection of rubber stamps. I have even made envelopes out of paper that is legal to mail 1st class but amuses (or annoys) the post office. No pun intended but the writing may be on the wall! I have a friend that I write to on a weekly basis, however I generally use Microsoft Works on my computer to actually write the letter, but I do send it by postal service. Does that count? When I do write letters I like to go all the way and write with a fountain pen though. I still write letters. So much is history of the family and the daily doings. I save letters and put them with my genealogy files. I also have friends who don’t have computers. I look forward to hearing from them. I have to admit that I do not put pen to paper, but I spend a LOT of time “writing” notes using the computer and lovely notecards. Any printer can be adjusted to any specific size of paper, so no particular type of notecards are necessary – just the ones that are lovely and that you like. And there are so many nice fonts on computers that make the note interesting and fun (or somber, as the case may be). It is AMAZING to me how often a piece of snail mail gets to someone to minister joy to them at JUST the right time. May God lead us to communicate in this way more often. I haven’t sent any handwritten letters or notes for quite some time due to the convenience and speed of the computer. However, there is something so special about receiving a handwritten note or letter. So much love comes through the written message. I am looking for an Amish lady to become penpals. Erik, do you have contacts in the Amish communities that may be looking for an English penpal? I would love to become closer to someone living plain, and I think that communicating with an Amish lady or young girl would be a wonderful way to close the gap between the English and Amish. I’m quite close to some women in the Shipshewana area, but had never though about writing to them. It might be fun to find someone in another community. Erik, if you have any suggestions I would certainly appreciate your input. Thanks, Erik! I do know several Amish women in the Shipshewana, Indiana area, and I should probably just ask one of them if they’d like to communicate through the mail since we only see each other a few times a year. Would you ask your Amish friends if anyone would like to write to an Australian Mother of five, grandmother of two. k am a reliable letter writer and have just started snail mail art, so fancying up the envelopes as well. I would love to have an Amish pen friend. I have always wanted an Amish pen pal but never thought they would write an English person. I’m 71 and have arthritis in my hands so do not do so much real handwriting anymore. But I’m a fast typist and use my computer’s Wordpad to write a lot of letters. Every week I correspond with friends by e-mail, too. I’m a retired-disabled librarian (42 years, much in Christian elementary schools). I began subscribing to The Budget newspaper 4 years ago and noticed the “Information Please” column where readers seek medical info for the layman, books, wicks for cookstoves or oil lamps, replacement china, and so on. Immediately began to use my home computer to locate all those things and more and write with the information to the requestor. Often, if they want a book, I can find it on Amazon.com. If the wish, I order it and have it sent to them, paying with my credit card. After they get the book, they repay me with a check or money order. I’ve NEVER failed to get repayment. And I get lots of letters. Word has spread about me and now I hear from all sorts by people by letter and sometimes by phone asking me to help them find/get something. I’ve made long term friends, too, like the teacher who has me help her get books for her school library that has now widened to include parents who read, too. There’s another column in the paper called “Showers” where friends/family write in and ask for letters, little gifts, money, whatever for others who have a severe need. 3 1/2 years ago there was a notice about an Amish woman with 4 children whose husband had deserted her (and the church) and needed help. I started sending her a bit of money every month and now we exchange notecards every month. A real joy. I’m childless and feel like they are my family. Blessings to you for all you do, how special! Sounds like a good idea! What a great thig to do. Wow Elizabeth, I think your “locator service” is one of the nicest things I have ever heard of anyone doing. Not to take anything away from your assistance to the abandonded Amish woman and her children, because that is exceptional too. To Elizabeth who orders books for the Amish…I was made aware of a site for books, called VaoreBooks.com. They for the most part are very inexpensive. It would be wise to check here as well. What a nice lady she is to do this favor for others who don’t have access to internet! A couple of years ago I wrote an article for our magazine called “The (Almost) Lost Art of Letter Writing.” (We even printed it in handwritten form. 🙂 ) In that article I lamented the loss of personality that email (and blogs :-)) inherently carry with them. It is like the drive-thru at the bank. You see the lady in the window, and you can talk to her by the intercom. But anytime a message goes through a machine, the personal touch is taken away. The “old-fashioned” letter written in ink cannot be equaled by a text or email. Which is why I believe so many people are attracted to the Amish and other groups that maintain a distance from so many machines. Sure machines speed things up. That virtual foot-washing would probably only take a second or two of your time. I write on average about 6-8 letters a month. Many of whom are to Amish and Mennonite friends I have made through The Budget. I love to recieve the letters. Each day I await mail delivery with the great anticipation that there might just be a letter in the mail! It is so nice to put pen to paper and know that there was time taken to write the letter that you are reading and that there will be time taken to read the letter that you are sending in return. It is so much more personal to see someone’s writing style than it is the font they have typed the letter in. I think for those that are unable to write and choose to type the letter instead and post it in the mail again there is an intimacy about holding the written/typed word as oppose to looking at a computer screen. I use to be very avid with penpalling and swapping of little friendship books etc. then life got in the way and I stopped. I have since been writing to many Amish and Mennonite men and women and the joy it brings to me is indescribable….I can only hope they get a small portion of the joy I feel and if they do then it is so worthwhile! I am a 29 year old who still writes letters frequently to several friends. I love writing them and receiving them. Unfortunately, several of my friends do not often reply with a letter in kind but it doesn’t mean I will stop writing. I delight in giving them the joy of receiving a letter. I am also teacher in a Waldorf school and cursive writing is taught in these schools as part of the curriculum. There are so many benefits neurologically and developmentally to practising cursive writing as well as letter writing and this is the reason that it is taught. Letter writing calls for impulse control, clear and orderly organization of thought and physical planning to ensure that your message is clear and legible. So many children have movement challenges these days, including the challenge of directing their six eye muscles to where they would like them to go. There are so many benefits to this skill. No matter how adept I remain at typing, I value my ability to write clearly even more and I always will. It took me a lot of practice to get to gain this skill and I am constantly rewarded by the joy others have when I put it to good use. I write letters frequently… but only to my Amish and Mennonite friends. I do not anticipate a revival of letter writing in society at large. Our writing muscles have become so unpracticed, writer’s cramp would be an insurmountable (and quickly occurring) problem. Do you think your Amish friends would like a long letter writer from Australia? Because I would LOVE an Amish letter pal. Hi Eric, Oh yes I am an avid letter writer. I even belong to a letter writing group. we send out Round robins to each other that travel from Australia, on to America and back again. A Round Robin is a letter written about one topic… for example books we love. The first person writes the letter about the topic chosen, then sends it to the next person on the robin list. Then she writes her own letter and then she sends both letters on to the next person, who writes her own letter and sends it on to the next person with the other letters, until when it gets to you, there are a huge amount of letters to read from all over the world. For any one who would like to join Round Robins, you can find Snail mail letter groups on the yahoo groups. I also have dear Amish and Mennonite friends that I love to write to and lots of family and friends as well. I’m not much of a writer. However, I do sit down every month and write to my Grandma. I started doing it as a way to encourage her when my grandpa’s health was failing, and since his passing, I’ve kept up the letter brigade. I can remember my other grandma faithfully writing to my dad when she would go to Florida for the winter…and my dad, being more of a non-writer than I am, wrote back once to her–in crayon! 🙂 As much as I dislike writing, I dislike picking out/sending cards even more! Sad…I know. As for the handwriting thing…I homeschool my children and I teach cursive handwriting. How can they “sign their name” on any formal document if they can’t write in cursive?! My best friend teaches in Indiana, where they have done away with cursive in the curriculum for public schools, and she thinks it a step backwards for the kids. Of course, with so many kids texting instead of actually writing/spelling things out, I hate to think where our future leaders’ written communication skills will look like. Melissa I got cursive in the 80s, but do kids even learn it anymore? I know Amish children do, and letters are often written in cursive. Many areas have stopped teaching cursive because the states/districts are rewarded based on how students do on standardized tests. Cursive is not on those tests :/ so many districts have decided to focus their time on other cirriculum which students will be state tested on. I was taught cursive in school but I hardly ever use it. When I write letters/notes I typically print. I find cursive hard to read but maybe that’s something that with practice it would come easier! Cursive is taught sparatically throughout the US. Like Chelsea said, schools are doing away with it because it’s not used on standardized tests. Horrible case of teaching to the test, and not really teaching to learn. The curriculum we use for homeschooling starts teaching cursive in 1st grade. My first graded is picking it up quickly, although she doesn’t like to use it. Like you, I didn’t learn how to write in cursive until 3rd or 4th grade–back in the 80’s. Unfortunately, cursive will become a “lost art” so to say. I think one’s cursive handwriting tells a lot about them. I hope I never see the day when cursive is completely done away with. I love writing and receiving letters. When I do write a letter I don’t get a response back. I once wrote a letter to my cousin and she never even acknowledged that she received it let alone read it. I asked her about it she said yes to both and changed the subject. It distrubs me that letter wrtiting hasn’t the appeal it once had in the past. I love stationary and find that makes the action all the more appealing. I guess I just have to do what works for me. As usual, so much can be drawn from this topic. I just wrote a handwritten letter yesterday as a matter of fact, as others, I enjoy the giving/receiving of them. It is awesome, to me, that the Swartzentrubers efforts paid off and they were able to reach an understanding/compromise. Good for them! For those that mentioned having a hard time finding stationary, there is an Amish store where I found quite a nice selection of 8.5 x 11 sheets of BEAUTIFUL stationary, and only about $3 a pack! Elizabeth, I was very touched by your post-what a wonderful inspiration you are! You found something fulfilling and helpful to others even with your own physical challenge, it can be done! I’ve been told that emailing Congressmen is advised because due to terrorist activity, the actual mail received in D. C. is delayed by several days for scanning. It made no sense to me or my parents, but when I was a kid I was told by educators to print everything under the idea that my writing was sloppy. Later I copied my mother who had the neatest handwriting I’d seen and taught myself to use handwriting. People have also, in recent years, have told me “for a man you have such nice writing”. As a history buff I write down the happenings of our family so that a future generation might now what we’ve been up to even though my life isn’t as exciting as that of my grandfather 100 years earlier. I teach third grade (in public school) and we have a handwriting program so I teach cursive every day. I think it is positively ridiculous to think that school districts would do away with handwriting and shame on those who do. My husband and I “courted” by writing letters to each other in college. We were thousands of miles apart and would write 6-10 page letters each week (Yikes! Hey, folks…we were in love.) It wasn’t that long ago either, 1990 (well, compared to even longer ago…:). This comment is the extent of my letter writing these days. I did send a rare letter off this week. This reminds me that I should be answering a letter I received, but it is more fun to read Amish America! What I like about a letter is knowing that the sender held the very same piece of paper in their own hands, and now I can hold it in my hands. How many of you have a Writer’s Bump, a callus on the middle finger? Wow, Thanks for mentioning that 1 wrong thing about my hands. I’ve been thinking I’m the only gal in the land to have a calloused area on my middle finger on my dominant (writing) hand. Even my nailbed is misshapen because of my handwriting position. I’ve recently (last 4 years or so) noticed that many people write with the ring finger being the steadying base that my middle finger is for my writing. Any comments from those who teach handwriting as to the positioning of the writing hand nowadays??? Yes, I do write letters! Love to! For one thing- Mom’s is a USPO employee so I have to do my part, right? For another, I just love it. Interestingly enough, Mom’s rural mail route covers an area with many Amish people. There are so many Amish who get their mail from her very small town PO that their office hasn’t been as affected by the decrease in mail volume as many. I write very few letters, e-mail or with pen and paper. I keep in touch through facebook mostly or call people. When my mother was alive she used to write to me but since she passed I rarely get real letters anymore other than the odd one from my sister sometimes. I write if someone writes to me but I do not take the initiative to write to other people regretfully. I prefer letters sent by post to e-mails if I get to choose. Yes, I too love writing and recieving letters. All through the years I used to write to my cousin and aunt, and for the past 16 years have corresponded the good old-fashioned way with several pen-pals in England. And I not only have the bump on my middle writing finger but my index finger has become misshapened with arthritis from so much writing ( and typing ) at my jobs over the past 40 years! I’ve used a computer at work and have one at home, but we only use our e-mail for business and are not on facebook ( just a ” friend ” to my son so we can see pictures of the grandkids ), and the only blog I’ve joined in so far is this one! I don’t know if it’s a generational thing or just an old-fashioned mindset, but I’m not keen on all of these new fangled things and still prefer to have a home phone ( only take the pay-as-you-go cell when we go away for the day or on vacation ), and correspond by a nice letter written on pretty stationery. My pen-pals and I still exchange beautiful cards for birthdays and holidays, and send postcards from wherever we go, too. It’s just so much more personal that way. As Valerie mentioned, you can still find pretty stationery at most Amish variety stores and book stores, and even some non-Amish bookstores and craft places like A.C. Moore and Michael’s, and believe it or not some old-fashioned type hardware stores still sell it, too. I’m a British Quaker and this article really rang bells for me. 20 years ago I used to receive regular letters from my sister in Australia, and my brother in America. Finding those letters on the mat gave me such a thrill, and somehow a sense of connectedness that email just doesn’t convey. Now they live just a few miles away and I almost feel I don’t know them as well as I did when they were on the other side of the world. Like Nancee I would love to have a like-minded penpal – Any takers? I’ve not heard of Canada 411 before, but Google found something for me. If I’ve got it right you’re at the Alderlea? I’m in Victoria, BC, and on Falaise Crescent. You go online, pull up Canada 411, go to people, not businesses, and you’ll find me. I am presuming we cannot give our addresses here? Or emails? I would love to write to you. I don’t write letters as much as I used to – can blame Facebook for that! I did write some handwritten letters to put in my Christmas cards this year and was surprised how quickly my hand cramped up and how sloppy my handwriting was compared to past years! I’m more out of practice than I thought. On the other hand, I’m sending out more “Get Well”, “Sympathy”, Thank You” cards and notes than I used to. After some deaths in the family and serious illnesses and surgeries, I realized how much getting those cards and notes in the mail lessened the pain on those occasions. I buy them at the dollar stores or even make my own – it truly is the thought that counts, cliche as it may sound! On a similar note, my hobby for many years has been photography and I have many precious pictures of family members and friends from get-togethers, birthday parties, etc. I’ve noticed my grown kids just have pictures on their phone, computers, etc, but not prints to share. The main reason I got on Facebook was to see pictures of my grandkids there. My kids always told me of the great pics they took of their children, but unless I went to their house and looked at their computer screen, I never got to see the pictures. (We were on “dial-up” and it could take a couple hours to download a couple pictures.) I miss seeing pictures of coworkers kids, etc – but no one has prints of their families anymore. I still write letters on occasion. Unfortunately my handwriting is atrocious, mainly due to nerve damage in my hands. If I need to make sure the person fully comprehends what I am writing I will type the letter and add a handwritten note at the bottom. I do still send cards to people all over the world. Yes, I still write letters, and am committed to doing it more often. It’s just more personal, and I enjoy the quiet time as I gather my thoughts to share with the recipient, usually family. And who doesn’t get excited when they find a real hand-addressed letter or card, hand-addressed in the mailbox? My latest idea is to start an Amish-style circle letter with my sisters and my mom. I think of it as a more personal and thoughtful version of “copy all” in an e-mail! Yes, I write about one a day. I spend more than that in postage right now b/c of sending photocopies of my dd;s school work to my dh in the Sandbox! I am a member of a circle letter. I’m the only Englisher in the circle. It does help when people cut the unused paper off their letters, as it keeps the 10 or so pages from going over an ounce and requiring more postage. I’ve started trimming my own pages. I still like to send handwritten birthday, Christmas and Easter cards, but can’t deny that typing 90 WPM and being able to not only correct spelling errors on the spot – but also to be able to move entire paragraphs around, reordering text to make a better statement – are huge advantages over pen-to-paper handwriting. There’s no going back for me! Just came across this website recently, very interesting. I am only 22 and never really had the chance to do any letter writing. I am sure I probably did something as a school assignment or something. I honestly can’t remember. As soon as I decided to finally get an email address, I haven’t looked back. In fact I get annoyed by anything that makes me have to use snail mail instead because it is super slow. And nowadays, schools are taking handwriting lessons out of the curriculum (which is sad because I love writing in cursive when I take notes in my lecture classes) so I imagine the whole writing industry itself is going out the window. Not sure how I feel about that part. The simple answer is YES. I still take time to write a few hand-written letters! It brings joy to sit with tea and reflect with pen and paper in a way that you can’t sitting at the computer. Sadly, penmanship is no longer offered in many schools. Thanks for the question (and blog); it’s great to reflect on something so important! As one of my penfriends says, “To get a letter, you have to write a letter.” Letter writing is not a dying art. It is not lost. It is not just something for those who do not use modern technology. It is also not a trendy, or retro, or a show of wealth. I’ve been a mail enthusiast most my adult life (I’m 55), and I write to people all over the world, of all ages and socioeconomic backgrounds. I don’t write my letters and postcards in cursive, but only because my printing is rather pretty, and my Asian penpals find it much easier to read than cursive. My grandchildren probably won’t learn cursive in school, but I’ll teach them. That’s the thing about traditional ways … they have to be handed down by one generation to the next. One can’t assume someone else will do the teaching. And my stationery is never stationary. Thank you for your article, which I discovered on Twitter. The Internet has made chatting about letter writing and finding penpals so much easier! Great comment Postmuse. Thanks for sharing your experience. Gee, “only” 20-40 a week? 🙂 And kind of funny you found a post about one of the slowest, most deliberate means of communication on a technology designed for maximum speed and brevity. God forbid, penmanship seems to be dying. Actually, I write Altdeutsch and Cursive Latin (used nowadays in Germany as well as the USA) fluently and have received many compliments on my penmanship. ONLY the LAZY would say it’s too hard to write by hand–and what will the poor dears ever do when the ‘lectricity goes out? Penmanship needs to be taught: otherwise, only a few of use will be able to read the historical documents in their original form, and that is an absolute shame! By the way, when I was in a Hebrew class once, the teacher also complimented me on the way I wrote Hebrew Script, so not to boast much, but I can count 3 forms of cursive in my repertoire. It’s not hard to learn, just practice. Try sending out Christmas cards–it’s a good way to practice penmanship, and the joy you share will be considerable–for the sender and the recipient! I find it relaxing and enjoyable to sit down and write a letter, over the years you develop a friendship, you know each others darkest stories and their brightest blessings. I love to go to the mail box and find a real letter even better when its hand written. I have just discovered “snail mail art” where you do art on the envelope, its so much fun. I wonder if it makes the mail me/women smile to see those pretty envelopes in their bundles. I am a Quaker woman of age. That seems so funny to type, because I am no age inside! At any rate, I would love to write to any age of Amish person, and think we could really learn a lot from each other about the particular aspects of how we were raised, the things we most appreciate and so on. I think we’d likely find much common ground and come to have a greater understanding of not only the person behind the pen, but also the life of the person behind the pen. It seems to me that this is the way to see borders/ignorance of the lives of others drop out of sight. I look forward to hearing from someone on this list who would like to penpal. Do the Amish keep written journals diaries of their lives? I know this wouldn’t be shared with members of the English world, or even non-family members, but I wonder if it is in fact done by the Amish? I keep a journal, but I am a history buff and want to keep a record of things that happened in my and family’s life for any future generations to look back at, partly because the documentation of previous generations in my immediate family was tossed or lost because a “what the point, their dead, their not going to use it again” attitude prevailed. Although lately, my entries have been somewhat lacking in daily scribbling as I’ve been busy. They’re just like anyone else- Some do, some don’t. My dad’s parents, I think, both did. Several of his siblings do. I wanted to write an ex girlfriend of mine but she only has a P.O. Box and the Post office districts have changed so I don’t know how I would as I don’t know her current zip code. Just type in the city/ town and state and zip code in the search bar and you’ll get the zip code for the PO you want. Leave a reply to Does anyone still write letters?